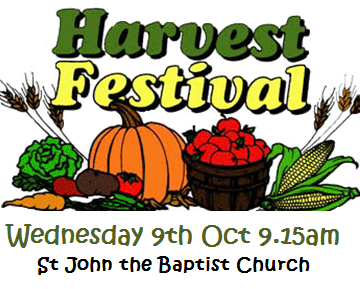 We hope many of you will join us at our traditional Harvest service at St John the Baptist Church. Toilet Twinning is raising funds for founder charities Cord and Tearfund, to enable people living in poor communities to have clean water, a decent toilet, and to learn about hygiene – a vital combination that prevents the spread of disease, reduces the number of deaths among children, and brings hope for the future. For a £60 donation, you can twin your toilet at home, work, school or church with a latrine. We will therefore be asking for our harvest donations to be money as it is our aim to twin all our toilets in this manner. We are aware that some families may also like to make the more traditional donations of produce. We will be pleased to receive these and intend to send them to the ‘Loaves and Fishes’ Scheme which supports local Sevenoaks families. This initiative was started by two St John’s mums three years ago and is now managed superbly by St John’s church community.